Ben Affleck’s first photo as Batman has been revealed by director Zack Snyder. 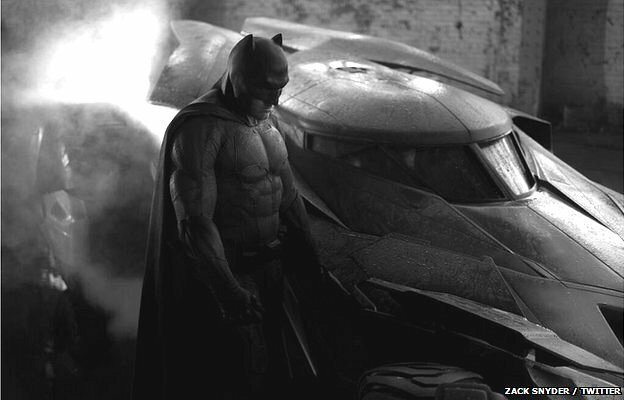 Ben Affleck is pictured standing next to the Batmobile in the brooding black-and-white shot, taken on set of the forthcoming Superman vs. Batman film. Although the actor was a controversial choice to play the caped crusader, the new photo has had a positive reception. Many have suggested it shows the older Batman from Frank Miller’s four-part comic book The Dark Knight Returns. Ben Affleck was not a universally popular choice to take over from Christian Bale. A petition on Change.org urging film studio Warner Bros to “remove Ben Affleck as Batman/Bruce Wayne in the Superman/Batman movie” has gathered more than 97,000 signatures since his casting was announced last summer. Ben Affleck has laughed off the criticism, saying he is “a big boy” who can “handle” the backlash. “When you get into the arena of those kinds of movies, these superhero movies, particularly ones that are working with characters that everyone’s known for so long, everybody’s got these strongly held opinions and preconceived ideas about what it should be,” he told Entertainment Weekly. “At the same time, I don’t think projections about something that hasn’t happened yet are all that meaningful. “I think at the end of the day, it’s like any other movie or project: You go out and make it great, people will say it’s great. If you go out and miss, you’ll hear about it. Ben Affleck will make his debut alongside Henry Cavill’s Superman, on May 6, 2016. The as-yet-untitled film is a sequel to Man of Steel and will also feature Gal Gadot as Wonder Woman and Ray Fisher as Cyborg.